These full-resolution sample images are files taken straight off my Fujifilm FinePix F200EXR 12MP Super CCD digital camera for you to view and download to your hard drives for evaluation only. Click on the image to view the original version of the JPG / JPEG image. 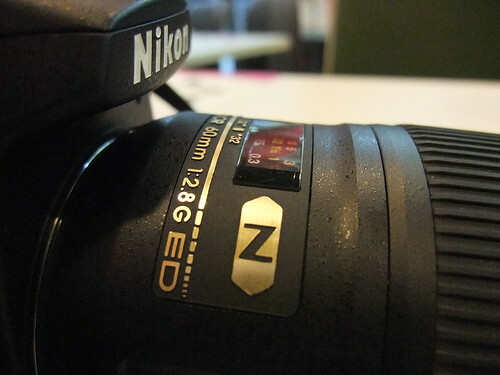 That’s my Nikon D90 with a Nikon 60mm f/2.8G AF-S Micro-Nikkor macro lens mounted on it. The photo was shot in a restaurant with warm white artificial lighting. It was also late evening outside, and some of that light filtered in. The F200 was left in EXR Auto mode, and it made all the decisions with regards to exposure, white balance, focus, the appropriate EXR mode to use, and everything else. I could never get this level of quality (definition, detail, tonality, color, dynamic range) from my Ricoh GX200 or Olympus SP-570UZ, even when shooting ISO400 with those cameras and downsizing the photos during the post-processing stage.